The Battle of Britain saved the country from invasion. If the RAF had been defeated all the efforts of the British Army and the Royal Navy would hardly have averted defeat in the face of complete German air superiority. With all Europe subjugated, Germany and Japan would later have met on the borders of India.This remarkable book traces the varied fortunes of the Royal Air Force in the 1930s, and shows how it readied itself for the mighty German onslaught in the summer of 1940 and won a great victory by the narrowest margins. 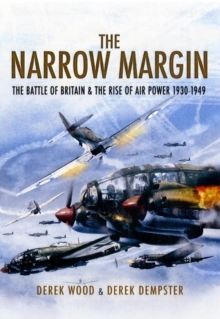 It provides a comphrensive account of the Battle of Britain, including the day-by-day summaries of the battle. 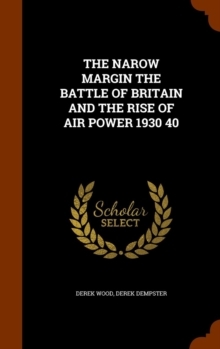 It is illustrated with photographs and maps, an appendix of the aircraft used by the Royal Air Force and by the Luftwaffe with schematic drawings, also a list of all pilots who flew in the Battle of Britain from July 10 to October 31 1940.The authors are military aviation experts and The Narrow Margin has been published in translation in France and around the world. They also wrote A Summer for Heroes and Jane's World Aircraft Recognition Handbook.